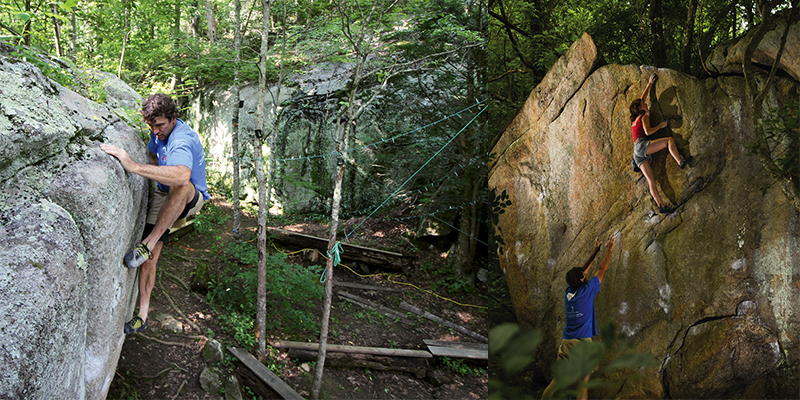 To support the conservation of Buckeye Knob and the Barn Boulders and learn about climbing options there, visit www.carolinaclimbers.org. The High Country has its first dedicated recreational climbing area, thanks to the Carolina Climbers Coalition, a statewide nonprofit. Last fall, the group purchased 55 acres of remote woodland and an important watershed at Buckeye Knob in Watauga County, permanently preserving a longtime favorite spot for local climbers. “It has a history and it’s a beautiful spot,” says Brian Payst, a Boone resident and CCC president. “It’s in a cove and protects the upper part of the watershed, and from the ridge, you look out across to Tennessee.” The property’s former owners, Highland Forestry and Timber, considered logging the tract before concerned climbers approached them about buying it.